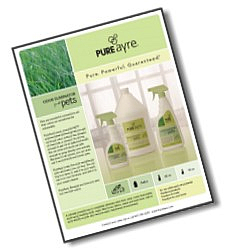 If you're a pet owner, PureAyre is your lifesaver for pet odors and stains. It's the safest and the most effective way to eliminate urine and other odors without harming your pet. Instructions for eliminating pet odors. What's Wrong With Other Pet Odor Eliminators? For example, Nature's Miracle is a bacteria-produced enzyme odor eliminator that contains alcohol. Despite this, the label claims it's non-toxic and safe to use around pets and kids. And the spray bottle version says to spray it directly onto your pet! Products like Nature's Miracle are also costlier and messier in the long run. Because you have to saturate a pet spot in order for Nature's Miracle to work, you buy more and wait up to two weeks for an area to dry while living with the odor of both the urine and the chemicals. Then, if it didn't work, you have to start all over again. Compare that to PureAyre. It works on contact with the pet odor so you use less and you have a much shorter drying time. In fact, we discourage you from soaking an area with PureAyre because it's just not necessary, and saturating an area can spread the urine contamination. Use PureAyre for pet urine odors, in litter boxes, when you're house training your dog, on wet dogs and doggy breath, and even in hamster and bird cages. No matter your pet, you can safely use PureAyre to get rid of odors around birds, hamsters, cats and dogs. 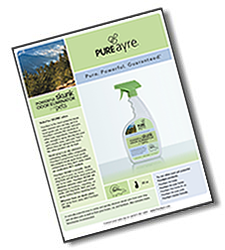 PureAyre is so safe and so effective, it's even recommended by the folks at Sugar-Gliders.com. Cat urine is the hardest odor in the world to eliminate. And that's where PureAyre proves its power. But it also gets rid of skunk odor, and it's powerful enough for use in situations with many animals, like veterinary clinics, animal shelters, kennels and more. In fact, we have an amazing tale about the power of PureAyre to remove pet odors even in a building that housed a pet store for over 35 years! ...it's the best I've found for chronic pet odor.